This article is about the use of two tracks on a railway line. For the sound recording technique, see doubletracking. "Double line" redirects here. For other uses, see Double line (disambiguation). A double-track railway usually involves running one track in each direction, compared to a single-track railway where trains in both directions share the same track. In the earliest days of railways in the United Kingdom, most lines were built as double-track because of the difficulty of co-ordinating operations before the invention of the telegraph. The lines also tended to be busy enough to be beyond the capacity of a single track. In the early days the Board of Trade did not consider any single-track railway line to be complete. In the earliest days of railways in the United States most lines were built as single-track for reasons of cost, and very inefficient timetable working systems were used to prevent head-on collisions on single lines. This improved with the development of the telegraph and the train order system. In any given country, rail traffic generally runs to one side of a double-track line, not always the same side as road traffic. Thus in Belgium, China, France (apart from the classic lines of the former German Alsace and Lorraine), Sweden (apart from Malmö and further south), Switzerland and Italy for example, the railways use left-hand running, while the roads use right-hand running. In Switzerland, the Lausanne Metro and railways at the Germany border area use RHT as well as all tram systems. The Semmering Railway in Austria uses LHT while most of the country is RHT. In countries such as Indonesia, it is the reverse (right-hand running for railways and left-hand running for roads). In Spain, where roads are RHT, metro systems in Madrid and Bilbao use LHT. In Sweden, the tram systems in Gothenburg (except for a Angered station and stations with iceland platforms), Norrköping and Stockholm (except for Alvik - Alleparken section) are RHT. The railroads (and the metro) use LHT in general, but in Malmö they use RHT due to the connection to Denmark. In the Ukraine, some sections of Kryvyi Rih Metrotram use LHT due to tramcars have doors only on right side, which makes it impossible to use RHT at stations with island platforms.On the (pre-1918) French-German border, for example, flyovers were provided so that trains moving on the left in France end up on the right in Germany and vice versa. Handedness of traffic can affect locomotive design. For the driver, visibility is good from both sides of the driving cab so the choice on which side to site the driver is less important. For example, the French SNCF Class BB 7200 is designed for using the left-hand track and therefore uses LHD. When the design was modified for use in the Netherlands as NS Class 1600, the driving cab was not completely redesigned, keeping the driver on the left despite the fact that trains use the right-hand track in the Netherlands. Generally, the left/right principle in a country is followed mostly on double track. On single track, when trains meet, the train that shall not stop often uses the straight path in the turnout, which can be left or right. Double-track railways, especially older ones, may use each track exclusively in one direction. This arrangement simplifies the signalling systems, especially where the signalling is mechanical (e.g. semaphore signals). Where the signals and points (UK term) or rail switches (US) are power-operated, it can be worthwhile to signal each line in both directions, so that the double line becomes a pair of single lines. This allows trains to use one track where the other track is out of service due to track maintenance work, or a train failure, or for a fast train to overtake a slow train. Most crossing loops are not regarded as double-track even though they consist of multiple tracks. If the crossing loop is long enough to hold several trains, and to allow opposing trains to cross without slowing down or stopping, then that may be regarded as double-track. A more modern British term for such a layout is an extended loop. The distance between the track centres makes a difference in cost and performance of a double-track line. The track centres can be as narrow and as cheap as possible, but maintenance must be done on the side. Signals for bi-directional working cannot be mounted between the tracks so must be mounted on the 'wrong' side of the line or on expensive signal bridges. For standard gauge tracks the distance may be 4 metres (13 ft) or less. Track centres are usually wider on high speed lines, as pressure waves knock each other as high-speed trains pass. Track centres are also usually wider on sharp curves, and the length and width of trains is contingent on the minimum railway curve radius of the railway. Increasing width of track centres of 6 metres (20 ft) or more makes it much easier to mount signals and overhead wiring structures. Very wide centres at major bridges can have military value. It also makes it harder for rogue ships and barges knocking out both bridges in the same accident. Railway lines in desert areas affected by sand dunes are sometimes built on alternate routes so that if one is covered by sand, the other(s) are still serviceable. If the standard track centre is changed, it can take a very long time for most or all tracks to be brought into line. 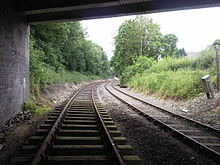 On British lines, the space between the two running rails of a single railway track is called the "four foot" (owing to it being 'four foot something' in width), while the space between the different tracks is called the "six foot". It is not safe to stand in the gap between the tracks when trains pass by on both lines, as happened in the Bere Ferrers accident of 1917. Narrow track centres on the Liverpool and Manchester Railway contributed to a fatal accident on opening day. A US naval scientist and submarine pioneer, Captain Jacques, was killed getting out of the wrong side of a train at Hadley Wood in 1916. Narrow track centres contribute to "Second Train Coming" accidents at level crossings since it is harder to see the second train – for example, the accident at Elsenham level crossing in 2005. When one track of a double-track railway is out of service for maintenance or a train breaks down, all trains may be concentrated on the one usable track. There may be bi-directional signalling and suitable crossovers to enable trains to move on to the other track expeditiously (such as the Channel Tunnel), or there may be some kind of manual safeworking to control trains on what is now a section of single track. See single-line working. Brühl train disaster, Germany – 2000. From time to time, railways are asked to transport exceptional loads such as massive electrical transformers that are too tall, too wide or too heavy to operate normally. Special measures must be carefully taken to plan successful and safe operation of Out-of-gauge trains. For example, adjacent tracks of a double line might have to be shut down to avoid collisions with trains on those adjacent tracks. To improve travel times and increase line capacity, the 300 kilometres (190 mi) of line between Junee and Melbourne, in Australia, is to be partially duplicated in a configuration called Passing lanes. Existing crossing loops are mostly 900 metres (3,000 ft) and 1,500 metres (4,900 ft) long, and these will be enhanced by loops 6 kilometres (3.7 mi) long which are long enough to be regarded as nearly double track. The process of expanding a single track to double track is called duplication or doubling, unless the expansion is to restore what was previously double track, in which case it is called redoubling. The strongest evidence that a line was built as single-track and duplicated at a later date consists of major structures such as bridges and tunnels that are twinned. One example is the twin Slade tunnels on the Ilfracombe Branch Line in the UK. Twinned structures may be identical in appearance, or like some tunnels between Adelaide and Belair in South Australia, substantially different in appearance, being built to different structure gauges. Tunnels are confined spaces and are difficult to duplicate while trains keep on running. Generally they are duplicated by building a second tunnel. An exception is the Hoosac Tunnel, which was duplicated by enlarging the bore. To reduce initial costs of a line that is certain to see heavy traffic in the future, a line may be built as single-track but with earthworks and structures designed for ready duplication. An example is the Strathfield to Hamilton line in New South Wales, which was constructed as mainly single-track in the 1880s, with full duplication completed around 1910. All bridges, tunnels, stations, and earthworks were built for double track. Stations with platforms with 11' centres had to be widened later to 12' centres, except for Gosford. The former Baltimore and Ohio Railroad (B&O) line between Baltimore and Jersey City, now owned by CSX and Conrail Shared Assets Operations, is an example of a duplication line that was reduced to single-track in most locations, but has since undergone re-duplication in many places between Baltimore and Philadelphia when CSX increased freight schedules in the late 1990s. The Menangle Bridge was single track (1863) but built for double track (1890s). A second track was laid temporarily to allow testing both tracks at once. The Long Island Rail Road's Ronkonkoma Branch was originally single track for most of its length, but land for a double track was purchased as part of a project to electrify part of the line in the 1980s. A double track was laid along the rest of the segment in 2018. Bluebell Railway: Horsted Keynes to Culver Junction (Lewes). Keighley and Worth Valley Railway – including bridge and tunnels and a deviation. Monkerei Tunnel in New South Wales – double track size at summit reduces fume problem in tunnel. Golgotha Tunnel near Eythorne on the East Kent Light Railway was only partly excavated for the second track. Skitube Alpine Railway – A provision for a second 300-metre-long passing loop has been made inside the tunnel. Linha do Leste and Linha do Alentejo in Portugal. The embankments in all bridges were built to double track but the second one was never installed. West Coast Line (Sweden). The line through Varberg is single track but prepared for double track with long enough bridges over the track. The national traffic administration (and predecessor) has since 1980 planned to build the double track, but couldn't for reason of noise rules applying to reconstructions. A new tunnel with a station was considered too expensive but is in the time plan now. When the capacity of a double-track railway is in excess of requirements, the two tracks may be reduced to one. In some countries this is called singling. Notable examples of this in the United Kingdom occurred on the Oxford-Worcester-Hereford, Princes Risborough-Banbury and Salisbury-Exeter main lines during the 1970s and 1980s. In all these cases, increases in traffic from the late 1990s have led to the partial reinstatement of double track. In New Zealand the Melling Line was singled to the Western Hutt Railway Station in Lower Hutt in 1958 after it became a branch line rather than part of the main Hutt Valley Line. A double-track tunnel with restricted clearances is sometimes singled to form a single track tunnel with more generous clearances, such as the Connaught Tunnel in Canada or the Tickhole Tunnel in New South Wales, Australia. In the case of the Tickhole Tunnel a new single-track tunnel was built and the two tracks in the original tunnel were replaced by one track in the centreline of the tunnel. Another case where this was necessary was the Hastings Line in the United Kingdom, where the tunnels were eventually singled to permit the passage of standard British-gauge rolling stock. Before the singling, narrow-bodied stock, specially constructed for the line, had to be used. As part of the Regional Fast Rail project in Victoria, Australia, the rail line between Kyneton and Bendigo was converted from double- to single-track to provide additional clearance through tunnels and under bridges for trains travelling at up to 160 km/h (99 mph). A similar process can be followed on narrow bridges (like the bridge north of Drogheda railway station in Ireland). The bridge over the Murray River between Albury and Wodonga is double-track, but because of insufficient strength in the bridge only one train is allowed on it at a time. Hoosac Tunnel, Pan Am Railways, Massachusetts, US. Old Main Line Subdivision, B&O, Maryland, US. Entire 58 miles (93 km) subdivision was single-tracked to utilize higher clearances of the 9 tunnels on the line. Whitehall Tunnel, B&O, Pennsylvania, US. Railways that become especially busy in wartime and are duplicated, especially in World War I, may revert to single track when peace arises and the extra capacity is no longer required. The Flanders campaign saw duplication of the Hazebrouck–Ypres line, amongst other works. Severe gradients made the headway in the uphill direction much worse than the headway in the downhill direction. Between Whittingham and Maitland, New South Wales, a third track was opened between Whittingham and Branxton in 2011 and Branxton to Maitland in 2012 to equalize the headway in both directions for heavy coal traffic. Triple track could be a compromise between double-track and quad-track; such a system was proposed south of Stockholm Central Station, but was cancelled in favor of Citybanan. In Melbourne and Brisbane several double track lines have a third track signalled in both directions, so that two tracks are available in the peak direction during rush hours. Triple track is used in some parts of the New York City Subway to add supplemental rush-hour services. The center track, which serves express trains, is signalled in both directions to allow two tracks to be used in the peak direction during rush hours; the outer tracks use bi-directional running and serve local trains exclusively in one direction. During service disruptions on one of the two outer tracks, trains could also bypass the affected sections on the center track. The Union Pacific Railroad mainline through Nebraska has a 108-mile stretch of triple track between North Platte NE and Gibbon Junction NE, due to a high traffic density of 150 trains per day. The Melbourne to Albury railway originally consisted of separate 1,600 mm (5 ft 3 in) gauge and 1,435 mm (4 ft 8 1⁄2 in) gauge single track lines, but when traffic on the broad gauge declined, the lines were converted to bi-directional double track 1,435 mm (4 ft 8 1⁄2 in) gauge lines. Quadruple track consists of four parallel tracks. On a quad-track line, faster trains can overtake slower ones. Quadruple track is mostly used when there are "local" trains that stop often (or slow freight trains), and also faster inter-city or high-speed "express" trains. It can also be used in commuter rail or rapid transit, usually with the two outer tracks carrying the local trains that stop at every station, while the inner tracks carry the faster express trains that stop at fewer, busier stations; this can also be reversed, with express trains on the outside and locals on the inside. At the local train stations, the express trains pass through the station at full speed. The most notable example of quadruple track in the United States, and perhaps the only four-track section of mainline therein, was the Pennsylvania Railroad's main corridor through the heart of Pennsylvania around the famous Horseshoe Curve. This line is now owned by Norfolk Southern. Other examples include the Hudson and New Haven Lines, both of which are shared between Metro-North and Amtrak in New York and Connecticut. The New Haven Line is quadruple track along its entire length, while the Hudson Line is only quadruple tracked along the shared portion from Riverdale to Croton–Harmon and along the shared track from Grand Central Terminal to Yankees–East 153rd Street. Amtrak's Northeast Corridor is quadruple tracked in most portions south of New Haven, but also has a few triple-track segments. Outside the United States the Chūō Main Line is an example of a modern, heavily utilized urban quadruple track railway. Quadruple track is used in rapid transit systems as well: throughout the New York City Subway, the Chicago "L"'s North Side Main Line, and SEPTA's Broad Street Line in the United States, and on the London Underground in the United Kingdom. The two tracks of a double-track railway do not have to follow the same alignment if the terrain is difficult. At Frampton, New South Wales, Australia, the uphill track follows something of a horseshoe curve at 1 in 75 gradient, while the shorter downhill track follows the original single track at 1 in 40 grades. A similar arrangement to Frampton could not be adopted between Rydal and Sodwalls because the 1 in 75 uphill track is on the wrong side of the 1 in 40 downhill track, so both tracks follow the 1 in 75 grade. Another example is at Gunning. Between Junee and Marina, New South Wales, Australia the two tracks are at different levels, with the original southbound and downhill track following ground level with a steep gradient, while the newer northbound and uphill track has a gentler gradient at the cost of more cut and fill. At Bethungra, New South Wales, Australia, the downhill track follows the original short and steep alignment, while the uphill track follows a longer, more easily graded alignment including a spiral. At Saunderton, United Kingdom, what became the London-to-Birmingham main line of the Great Western Railway in 1909 was initially part of a single-track branch line from Maidenhead. Down trains follow the route of the old branch line, while up trains follow a more gently graded new construction through a tunnel. This scheme avoided the cost of a new double-track tunnel. In the Fraser Canyon in British Columbia, Canadian National and Canadian Pacific each own a single track line - often on either side of the river. The companies have a joint arrangement where they share resources and operate the canyon as a double track line. Directional running is when two separate lines are operationally combined to act as a double-track line by converting each line to unidirectional traffic. An example of directional running occurs in central Nevada. The Western Pacific and Southern Pacific Railroads, longtime rivals who each built and operated tracks between northern California and Utah, agreed to share their lines between meeting points near Winnemucca and Wells, a distance of approximately 180 miles (290 km). Westbound trains from both companies used the Southern Pacific's Overland Route while eastbound trains used the Western Pacific's Feather River Route (now called the Central Corridor). The Union Pacific Railroad has since acquired both of these lines, and continues to operate them as separate lines in a directional running setup. Amtrak also runs the California Zephyr along these routes. In the Nevada example, crossovers were constructed where the lines ran in close proximity to allow reverse movements. This was necessary as at points the two tracks are several miles apart and some destinations can only be accessed from one of the lines. In other cases, where the shared lines already run in close proximity, the two companies may share facilities. In Conshohocken, Pennsylvania, where the former Reading Railroad and Pennsylvania Railroad shared lines, the lines even shared overhead electrical wire supports, for a 2-mile stretch on the northern bank of the Schuylkill River. Both lines eventually came under Conrail ownership in 1976, with the former PRR line being abandoned and now used as a hike/bike path. An unusual example used to exist on the Isle of Wight, where until 1926 parallel tracks between Smallbrook Junction and St John's Road existed. The Southern Railway installed the actual junction, but it was only used during heavily trafficked summer months. During the winter, the lines reverted to separate single-track routes. Because double and single track may use different signalling systems, it may be awkward and confusing to mix double and single track too often. For example, intermediate mechanical signal boxes on a double-track line can be closed during periods of light traffic, but this cannot be done if there is a single-line section in between. This problem is less serious with electrical signalling such as Centralized traffic control. ^ Taplin, Michael (1995). Light Rail in Europe. Capital Transport. pp. 126, 128. ISBN 978-1-85414-180-4. ^ Vril (13 October 2013). "Криворожский скоростной трамвай". Retrieved 26 June 2018 – via YouTube. ^ Gerrit Nieuwenhuis (2005). Nieuw Spoor. De Alk bv. p. 91. ISBN 9060132467. ^ "Die Functionsweise der Apparaturen auf den automatischen Kreuzungsstationen ist so programmiert, dass den Zügen immer freie Fahrt über das Stationsgleis mit der höheren V max signalisiert wird, sofern der vorausliegende Abschnitt frei ist." Paul Caminada (1982). Der Bau der Rhätischen Bahn. Orell Füssli. p. 158. ISBN 3280014239. ^ "Pioneer of Submarines". The Argus. Melbourne. 29 November 1916. p. 8. Retrieved 30 June 2011. ^ "OPENING OF THE RAILWAY TO PICTON". The Sydney Morning Herald. National Library of Australia. 21 July 1863. p. 8. Retrieved 9 September 2012. ^ "Long Island Rail Road Double Track Project" (PDF). mta.info. Metropolitan Transportation Authority. February 2013. Retrieved April 10, 2015. ^ Solomon, Brian (2003). Railway Masterpieces. Newton Abbot: David & Charles. p. 122. ISBN 9780715317433. OCLC 52695896. ^ Harwood, Jr., Herbert H. (1979). Impossible Challenge: The Baltimore & Ohio Railroad in Maryland. Baltimore, Maryland: Barnard, Roberts. p. 174. ISBN 0-934118-17-5. ^ "Hunter Valley Rail Freight Corridor". Railway Technology. Retrieved 2018-09-30. ^ "Canadian Pacific and Canadian National Sharing Tracks in the Fraser Canyon". Trains Forum. Retrieved 2018-09-30. ^ "Eureka County, Yucca Mountain Existing Transportation Corridor Study". Eureka County – Yucca Mountain Project. 2005. Retrieved 2010-05-08. ^ Nevada Road and Recreation Atlas (Map) (2003 ed.). 1:250000. Benchmark Maps. 2003. p. 41–44. ISBN 0-929591-81-X. ^ Hardy, Brian (2003). Tube Trains on the Isle of Wight. Harrow Weald, Middlesex: Capital Transport. p. 8. ISBN 1-85414-276-3. Wikimedia Commons has media related to Double-track railway lines.